The Christmas rose is one of my favourite flowers. It is technically a mountain plant but will grow well in most gardens in the UK that can offer shade and a humus-rich soil. It is also known as the winter rose or snow rose, and this refers particularly to the plant Helleborus niger – there are a number of different hellebores but this one was called the Christmas rose due to a Swiss legend that grew up around it. The legend tells of a little shepherdess who was out on the mountainside one cold wintry night, tending her sheep. Her name was Madelon. As she sat out in the night, wise men and shepherds passed by on their way to visit the Christchild. They all had gifts to give the baby – the wise men carried gold, frankincense and myrrh; the shepherds brought doves, honey and fruits. Madelon, realising she had nothing to give the newborn baby, began to cry. As her tears dropped on to the snow, an angel appeared and wiped away the snow to reveal a pure white flower: the Christmas rose. The story goes that Madelon took the rose to the sleeping child. The species Helleborus niger is traditionally white flowered, although sometimes the edges of the flowers are tinged with pink, and it does indeed flower at Christmas time. In fact most of the hellebores flower throughout the dark winter months and this is what makes them such valuable plants in the garden. The hellebores are not really roses at all but are from the Ranunculacae family, the same family as the buttercup. It is an evergreen perennial plant, which means it keeps its leaves and flowers every year in the right conditions. The species niger has been bred successfully with the other hellebore varieties like Helleborus orientalis to give an amazing array of flower types and colours; everything from the pure white to spotted, deep purple and cultivars with double petals. They grow very well under shrubs and will thrive in semi-shade with some good compost added when you plant them. Grow them in an area with deciduous shrubs and they will add interest when the other plants have lost their leaves, but will not be that noticeable in the summer months when everything else is growing up and flowering. I have quite a collection now and have picked them up as I’ve seen different varieties. It’s best to buy them in flower around this time of year so you know exactly what you are getting. Grow them with pulmonarias and woodland bulbs like snowdrops and aconites. They will naturalise well, although some of the orientalis ones tend to seed down and produce lots of dusky pink flowered offspring all in a similar colour. My tip, other than buying them in flower, is to put them where you will see them in the middle of winter. I’d been planting mine in the back garden under fruit bushes but actually I don’t tend to go out there in the winter so the stunning flowers were almost forgotten. This autumn I have moved most of them to near the front door in the hope we will enjoy them this winter. 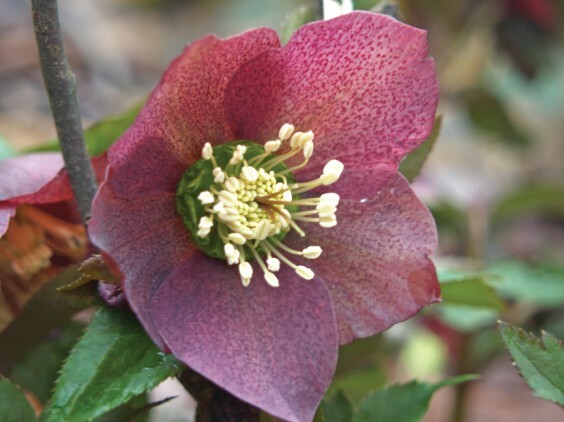 The Helleborus niger and orientalis varieties tend to flower around the same time through the winter months, while Helleborus foetidus flowers in the early spring – this one has deeply divided leaves and a pale green flower, sometimes tinged with purple edges. Because of its early spring flowering it is very valuable for bees, providing them with early nectar as they wake up. The leaf texture contrasts well with the other hellebores and woodland plants. All hellebores are poisonous – the name hellebore comes from the Greek meaning “to injure” and “food”, which tells you a lot! The black hellebore was, according to folklore, used to treat a range of conditions from paralysis to gout and even insanity. Most of the hellebores hold their flowers downwards as if they are nodding towards the ground, so they need gently lifting to see the exquisite flower patterns and petals to the best advantage – this is another reason to plant them where they are accessible. If you have enough and are happy to cut them as a winter flower for the house, they look wonderful as flower heads in water. Either way, enjoy this beautiful flower and have a great Christmas.